Is there something wrong with this picture? No, you’re not hallucinating…we removed the permanent cart traffic barrier (rope-stakes) along the path on #6. This hole/fairway had always been a problem area at Hilldale in respect to staying wet. Therefore, cart traffic was kept on the path at all times. Well…we (Hilldale mgmt.) want to try doing away with the barrier and allow our players to drive directly to their ball (90 degree rule applies of course!). A sand topdressing program implemented several years ago has paid big dividends in providing a firmer fairway surface, and during those times when wet conditions are present…we will just treat this hole like the rest of the course and limit traffic to the cartpath where signs are posted. When you are allowed to drive on the fairway, please obey the traffic signs and posts located near the green/approach. 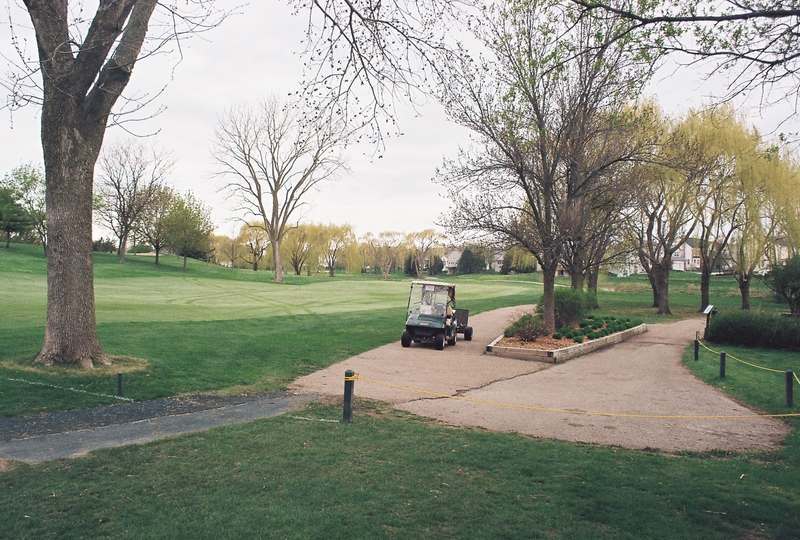 And please…at no time should any cart traffic be closer than 30 ft. around the greens (putting surface) on any hole at Hilldale. We hope and expect this change on the 6th hole to speed up the pace of play…so let’s try something different that everyone can appreciate. Thanks for your cooperation and for playing golf at Hilldale GC. This entry was posted on Monday, May 9th, 2011 at 10:12 am and is filed under Uncategorized. You can follow any responses to this entry through the RSS 2.0 feed. You can leave a response, or trackback from your own site.